Today is Paskha (Easter) in Russia, it’s a bright and warm festival that is celebrated among Orthodox Christians. One of the traditional and famous treats for this day are died eggs, kulichi and paskha (in my next post). During this day we congratulate each other and say ‘Христос Воскресе’ which means Christ is risen, and the reply is ‘Воистину Воскресе’ – indeed hi is risen. 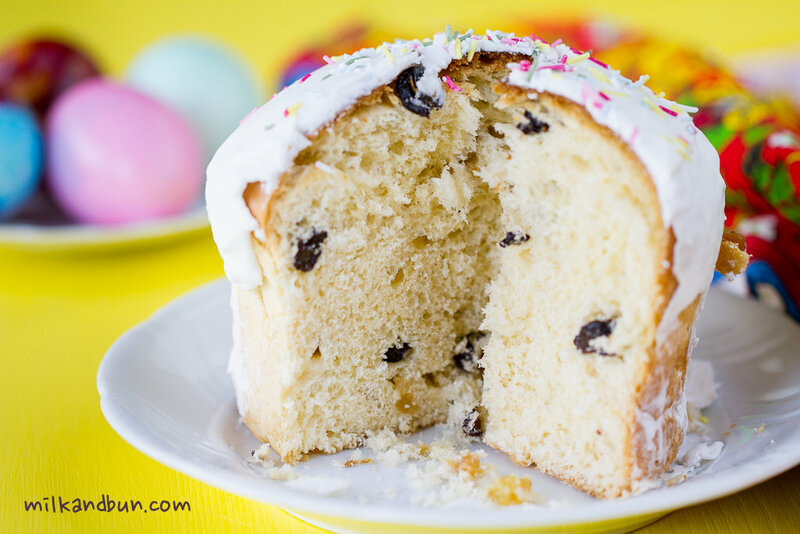 Kulich is a special Easter sweet cake/bread which usually has a cylindrical shape and decorated with white icing. It’s made from rich yeast dough; raisins, currants or candied fruits can be added. Traditionally kulichi have a cylindrical shape, and some Russian housewives use empty tins from pea or beans for that purpose. After baking and cooling kulichi is glazed with white icing (egg white or water with sugar) and decorated with edible sugar beads, flowers and thin candle. Kulichi and died eggs can be also blessed in church; a part of Easter treats usually is leaved in church for poor people. In a large mixing bowl, sift 100g of flour, add salt, yeast, warm milk and stir to combine. Cover with a wet kitchen towel and let it rise for 30 minutes. Meanwhile, in a small bowl, whisk a whole egg, egg yolk, vanilla and sugar with hand or electric mixer for 2-3 minutes until pale. Add egg mixture and butter to the dough, mix to combine. Sift the remaining flour and knead to combine. Cover again with wet kitchen towel and let it rise for 30-40 minutes. Wash raisins and currants, blot it up with paper towel, sprinkle with a teaspoon of flour – you need to cover all raisins with some flour, it allows them to be evenly distributed throughout the dough. Add raisins and currants to the dough, mix into the dough. Cover with wet kitchen towel and let it rise for 60 minutes. Line baking pans with baking paper, grease with butter. Divide the dough bettween two baking pans, the dough should occupy 3/4 of the volume. Cover and let it rise for 20-30 minutes. Bake in preheated 100C oven for 10 minutes, then in 180C for 30 minutes or until the toothpick inserted into it gets back dry. If the top become too golden – cover kulichi with a piece of foil or baking pepper. Cover kulichi in the foil and keep in the fridge up to 3-4 days. 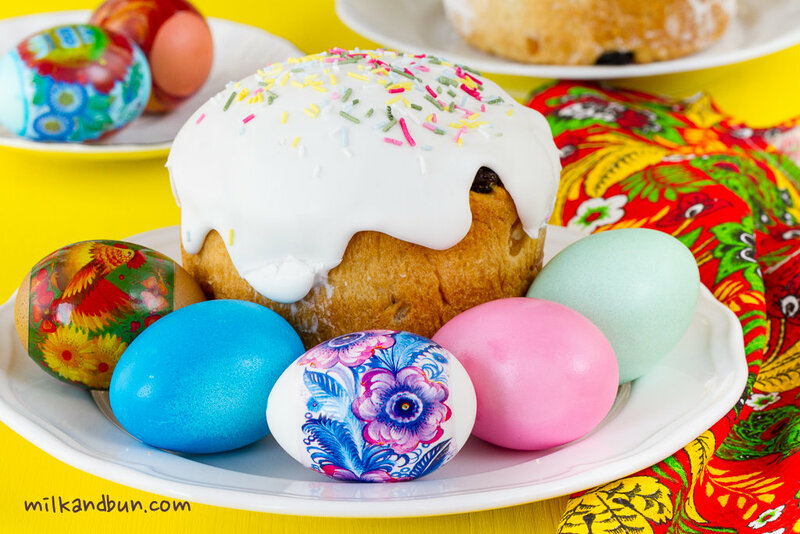 Apr12April 12, 2015 • By milkandbun • This entry was posted in Baking, Festive Cooking, Russian cuisine and tagged baking, cake, Easter, Easter cake, kulich, recipe, Russian, Russian food, Russian tradition. Bookmark the permalink. 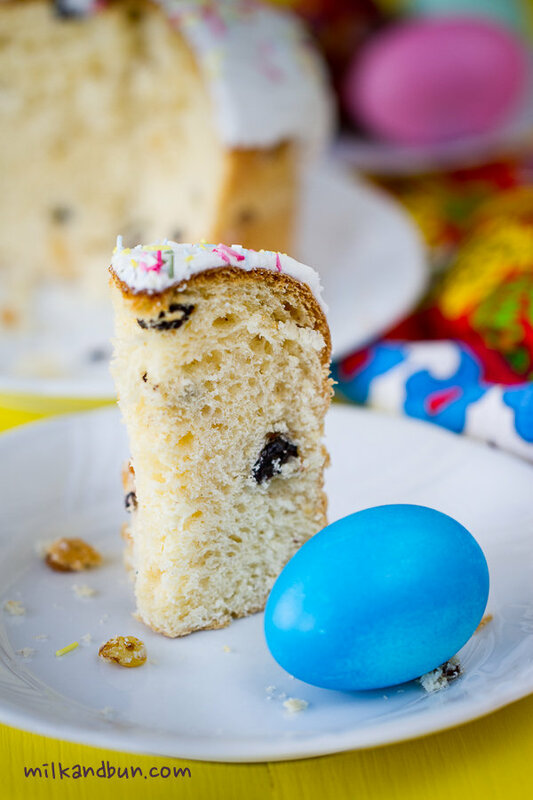 When I used to learn Russian language, I heard of this recipe Kulich. It must taste so good, and your pictures just prove it. Thanks for sharing. Looks beautiful Mila! Love your photos!